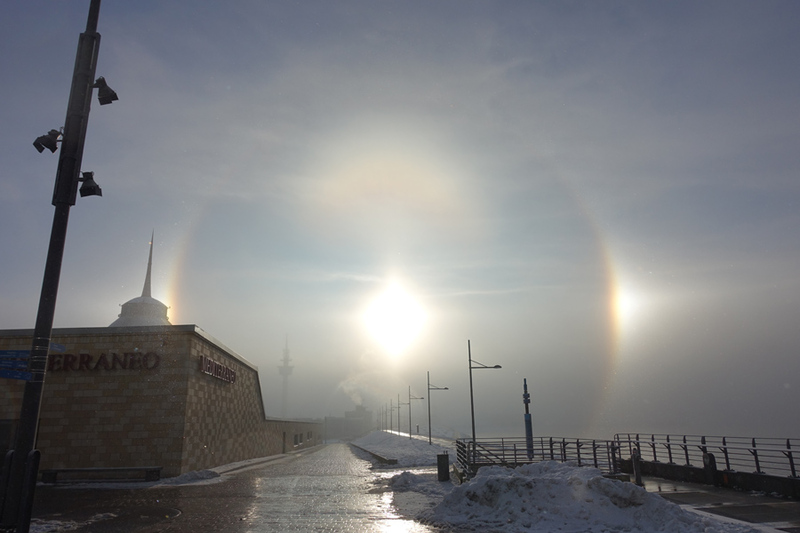 An impressive ice fog halo phenomenon occurred in Bremerhaven at Northern Germany’s North Sea coast on 21 January 2016. It lasted from the morning into the early afternoon. 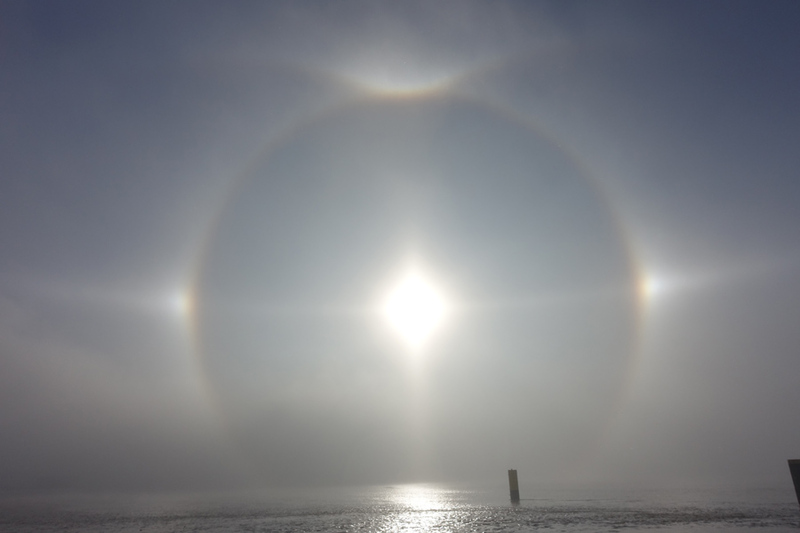 To observe such a halo display in Germany is quite rare by itself, but to have it in ice fog directly at the relatively mild coast is certainly exceptional. The ice fog had formed the previous evening and had limited the visibility of the northern lights display that night (20 January 2016). 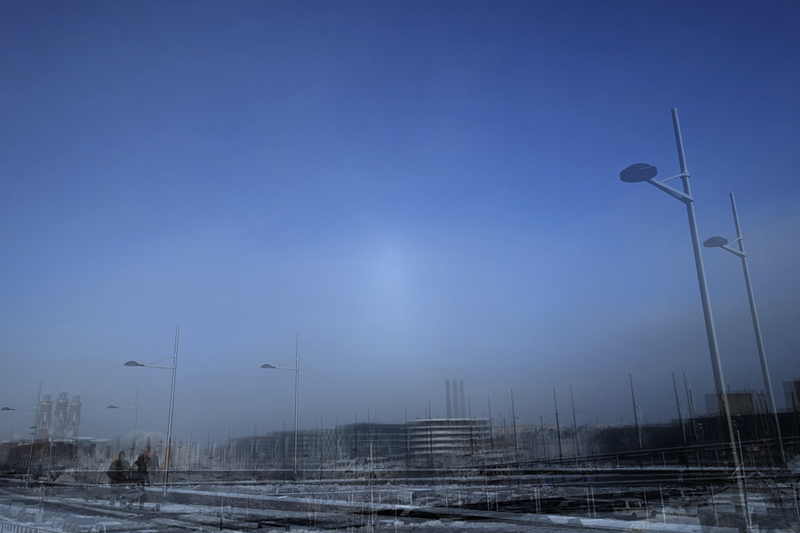 The minimum temperature recorded by the station of the German Weather Service at Bremerhaven’s harbour on the morning of the 21st was -8.6 °C (close to the observing site). The temperature rose to a maximum of -6.0 °C in the afternoon. 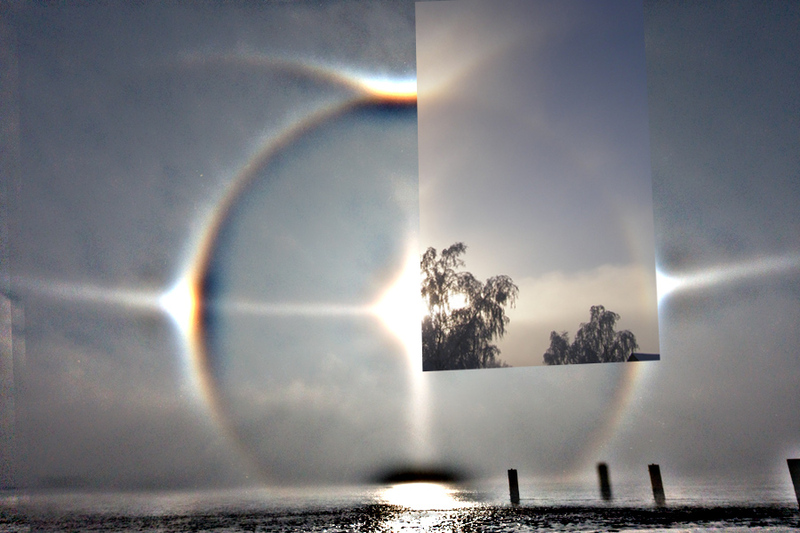 The halos disappeared completely at times when banks of dense fog covered the sun. Also, due to my regular job, I was not able to observe the halos continuously during the day. 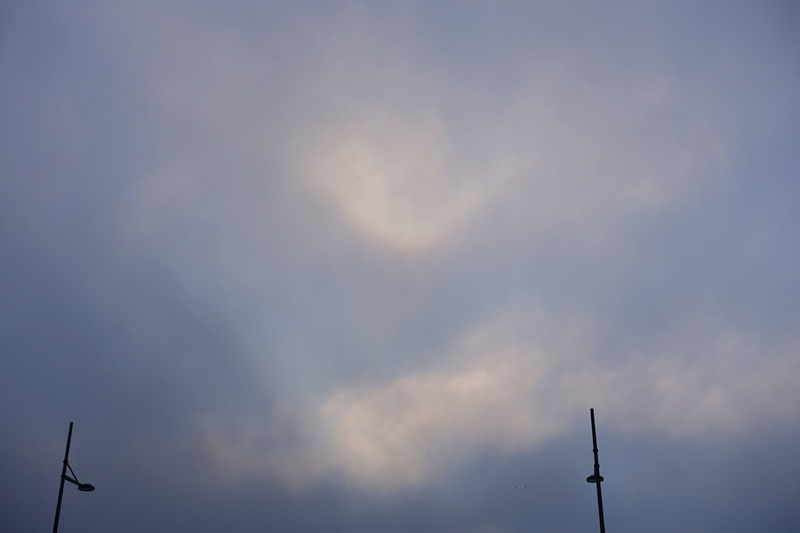 The most impressive time of the halo phenomenon that I was able to record was between 12:45 and 13:00 CET. 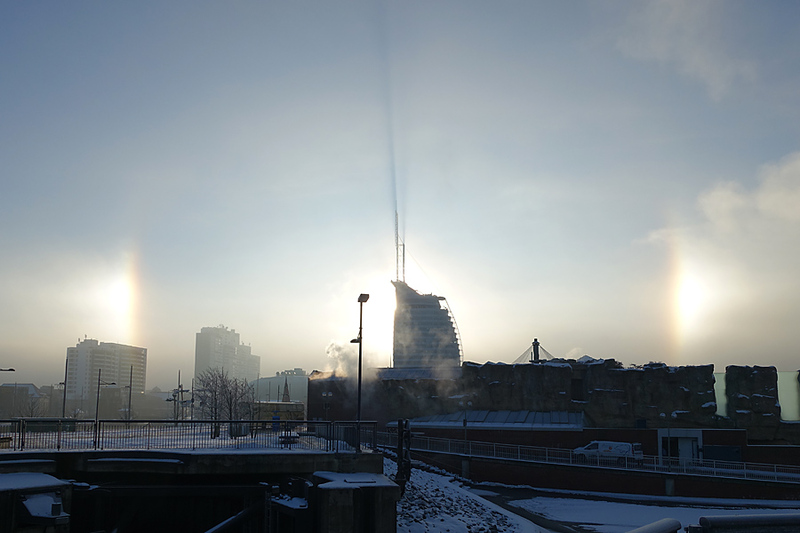 I noticed the ice fog halos at about 9:45 CET on my way to work in the area of the Neuer Hafen (New Harbour). 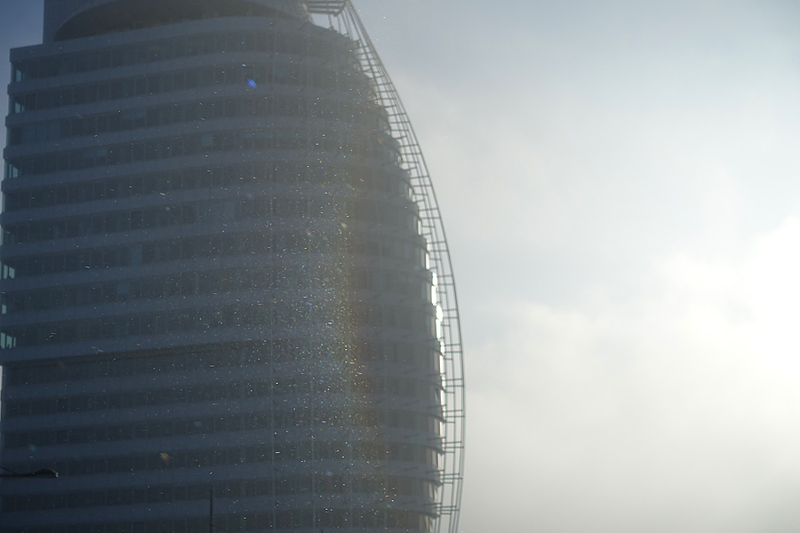 While the area further inland was covered by dense fog, there were breaks in the fog close to the river Weser and the sun was shining brightly. 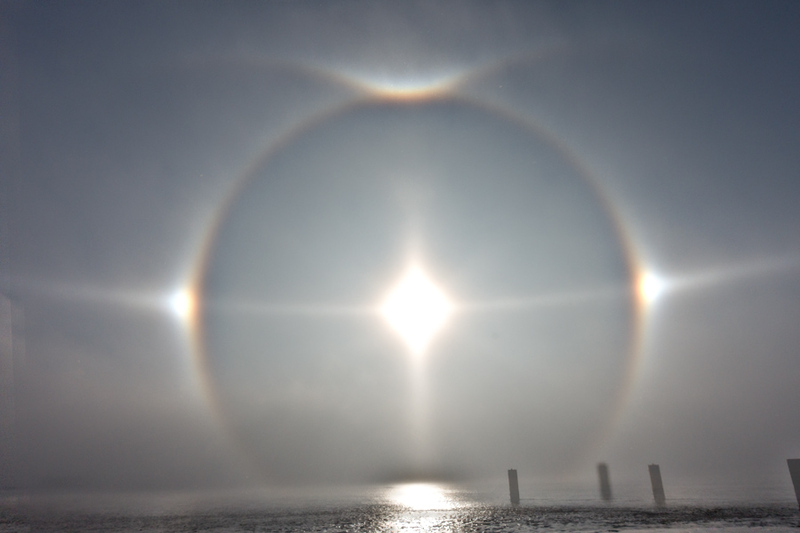 When I crossed a draw bridge, to my great surprise, I suddenly noticed an extremely bright left sundog to my left and parts of the 22° halo in the fog. 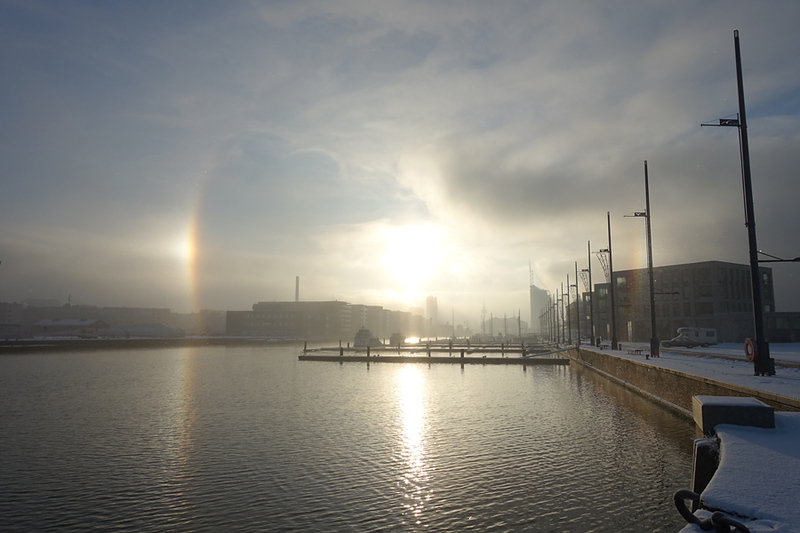 Ice fog halos in Bremerhaven! At the North Sea coast! – were my excited thoughts. I parked my car as quickly as I could and took several photos (Sony DSC-RX100M3). 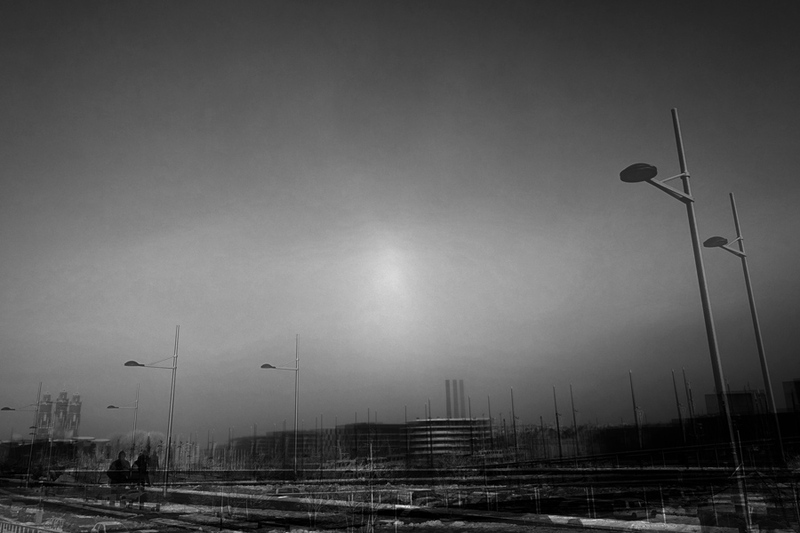 However, a dense bank of fog moved in only a short while later and the halos faded rapidly. Of the sundogs only a few glittering ice crystals remained and then those were gone, too. Thus I was able to properly park my car and head for work on foot. However, this took much longer than the usual 10 minutes. This was because on the way halos appeared, again. 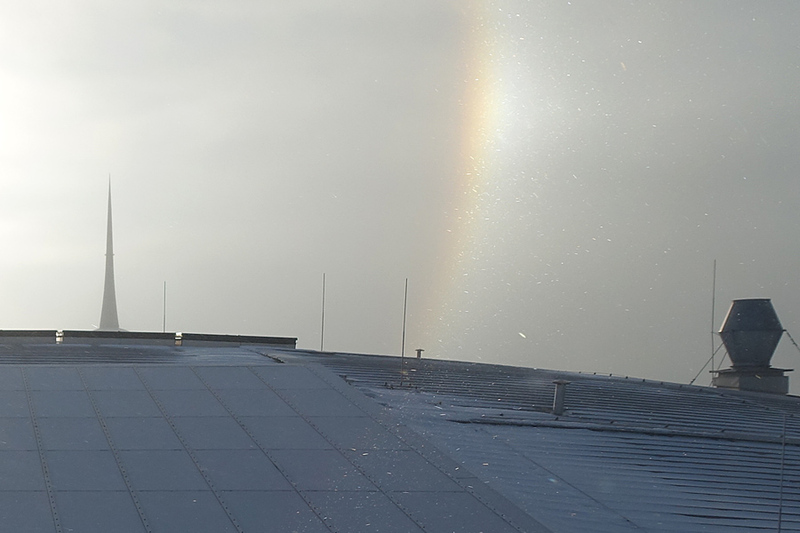 The sun came out and so did two very bright parhelia. 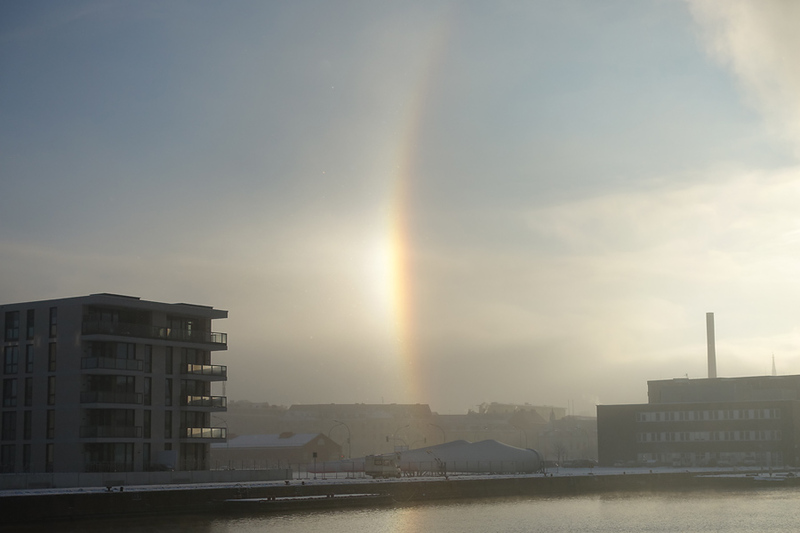 Then the fog became a little denser and the 22° halo and the circumzenithal arc appeared (about 10 CET). On the roof of the building inside which I work, I was able to take more photos (10:15 to 10:20 CET). The ice fog had become so dense that I was immersed in a cloud of ice crystals and could see halos right in front of me (video). Even in between my camera and me was I able to see the twinkling of 22° halo ice crystals – at least when I held the camera at arms’ length. There was glittering below the 22° halo, too, which likely stemmed from the lower tangent arc. All these were effects that I had never seen before! 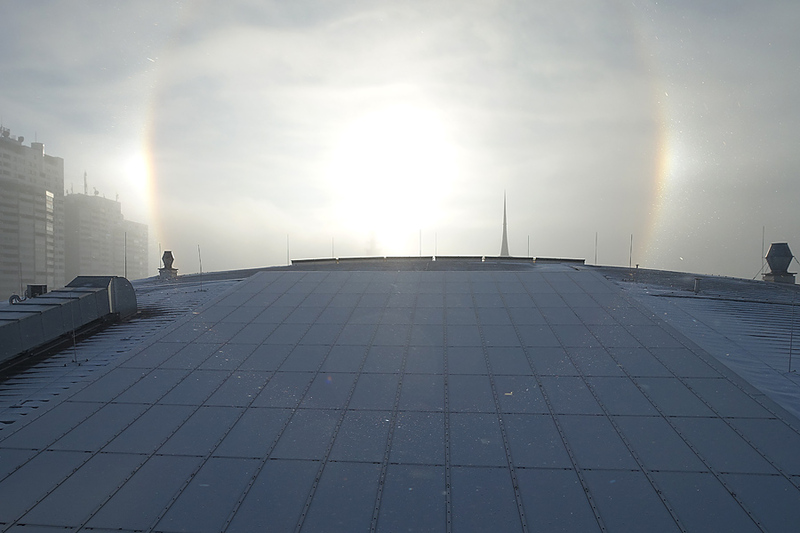 Probably not surprising as this was only my third ice fog halo display. 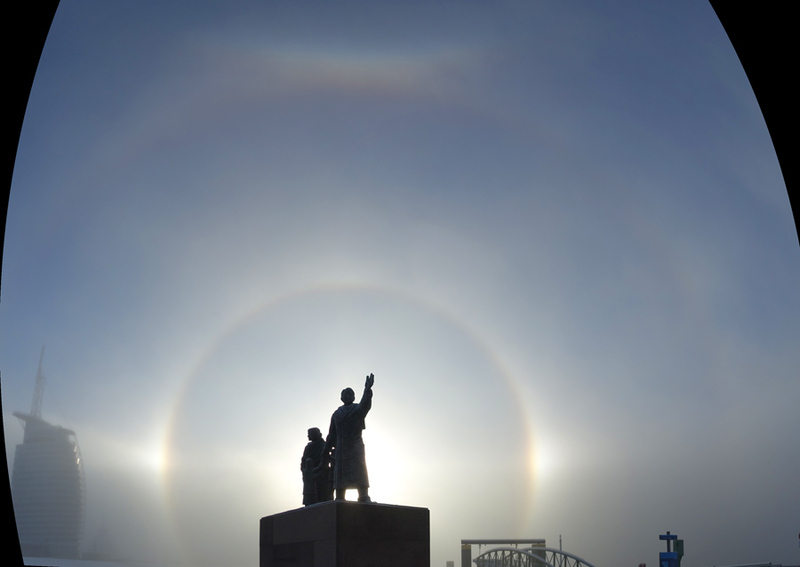 The other two had occurred only a few weeks earlier during the AKM’s halo seminar at Boží Dar – in the area where Claudia and Wolgang Hinz took the now famous Neklid ice fog halo phenomenon photos in January 2014. I left the building and went to the bank of the river Weser, again. Now, the halos were spectacularly bright and all around me I could see the twinkling of the ice crystals in the air. These looked like tiny needles on my parka. 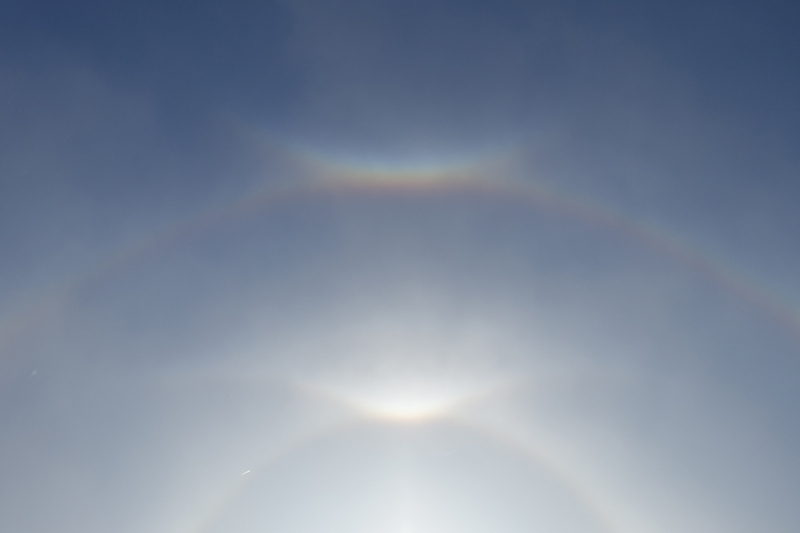 Both sundogs, the 22° halo, and upper and lower sun pillars were visible as well as the upper tangent arc and the parhelic circle. The latter stretched to about 40° left and right of the sun. 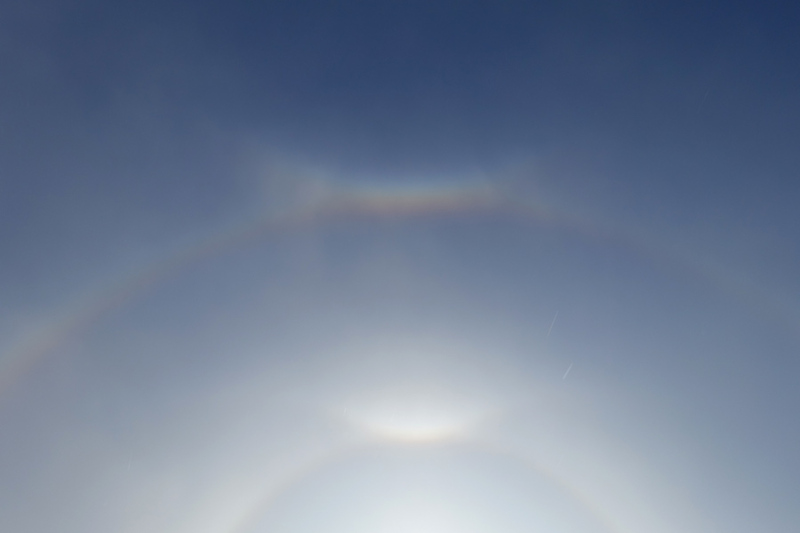 Adding to this were a bright circumzenithal arc and a weak 46° halo and/or supralateral arc. 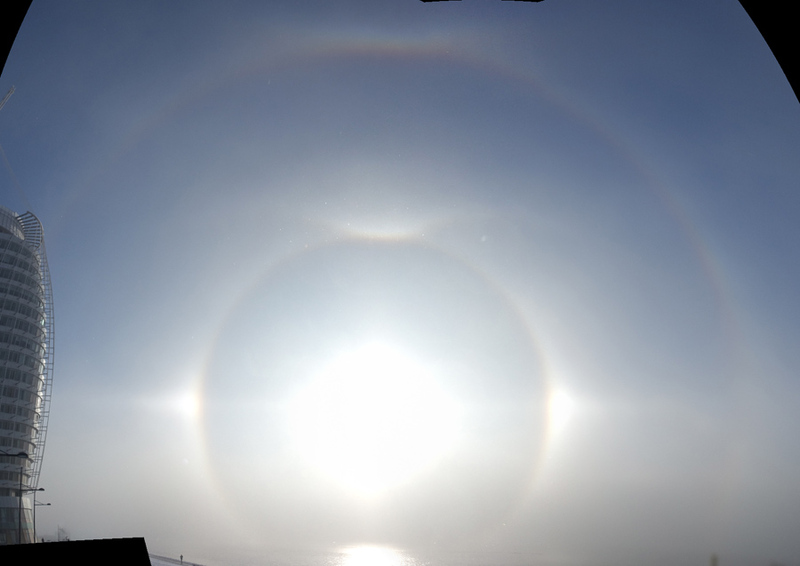 The overall appearance of the halo phenomenon at 10:35 CET can be seen in the three panoramas created from single images. 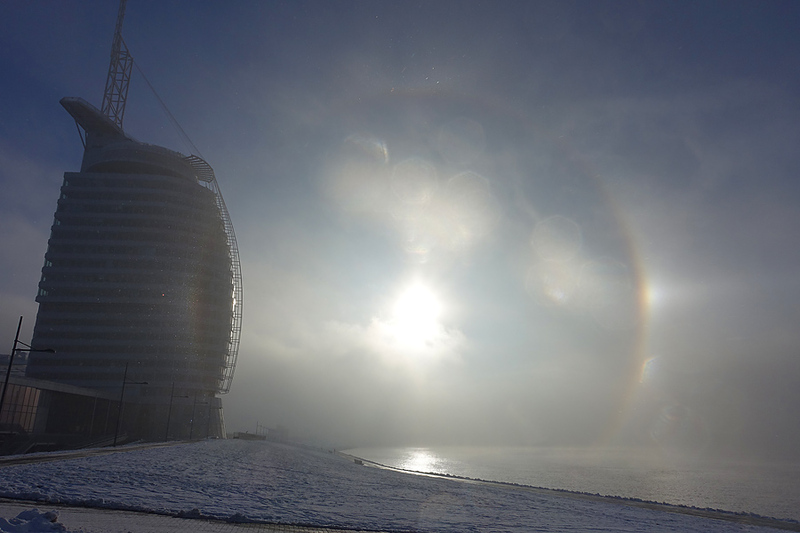 At 10:45 CET another dense fog bank covered the sun and the halos disappeared for ten minutes. Then the show continued with varying brightness. Again, I was surrounded by a cloud of ice crystals so that the halos seemed to be so close that I thought I could touch them. 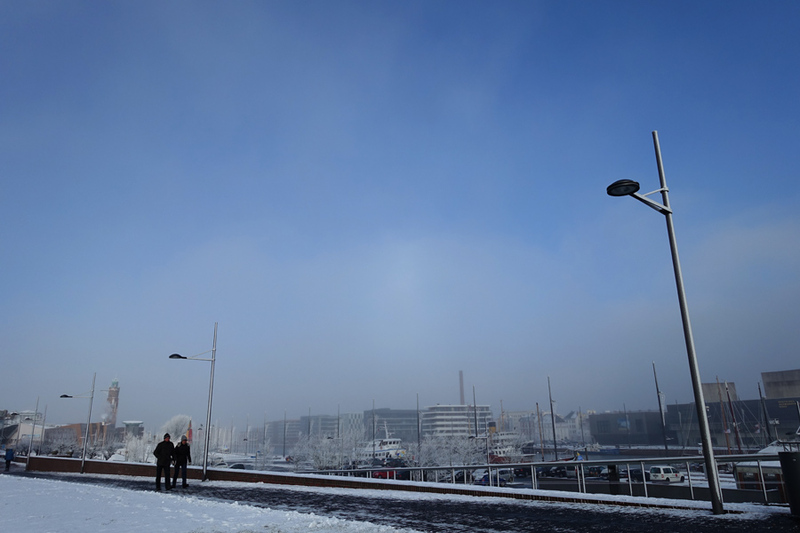 However, at 11:10 CET, dense fog moved back in and there were no halos visible for a longer while. 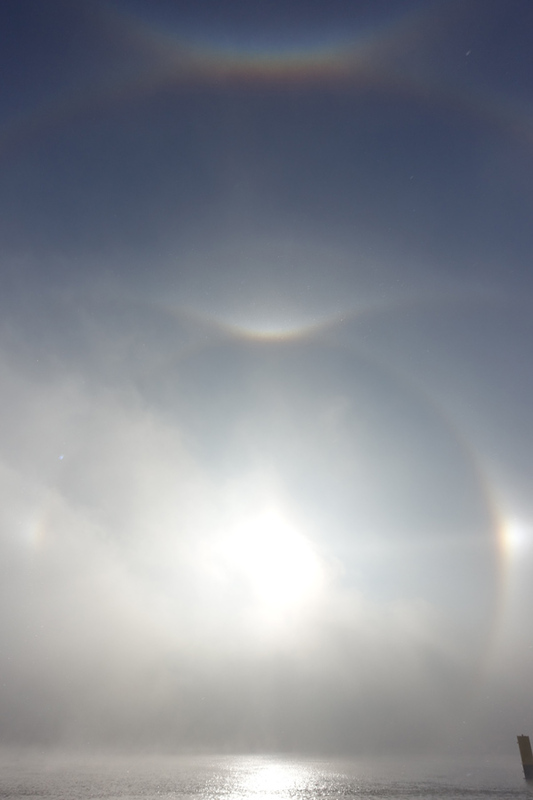 It was about 12:45 CET when I noticed that the halo phenomenon had reappeared – even grander than before! All the halo types described above were visible at the same time. This phase lasted for only 15 minutes before the dense fog returned and the halos disappeared. Towards the afternoon, this fog gradually turned into a low cloud deck without halo activity. However, just before the halos disappeared, I noticed a faint Tricker’s anthelic arc at the anthelic point. A single image and a stack of three images (contrast enhanced) are shown here. Seeing Tricker’s anthelic arc was a first for me. The Moilanen arc also seems to have been present in the display as close inspection of the images and additional image processing reveals. When unsharp masking is applied to the images recorded around 12:55 CET, a V-shaped structure right at the expected location becomes visible. The image sequence shows an unprocessed, single image (where the Moilanen arc may already be just visible), then a stack of three images with single and double application of unsharp masking and, finally, the latter image with a Moilanen arc recorded by Petr Kousal as an inset. The image processing also shows the presence of the helic arcs that cross each other in the sun. 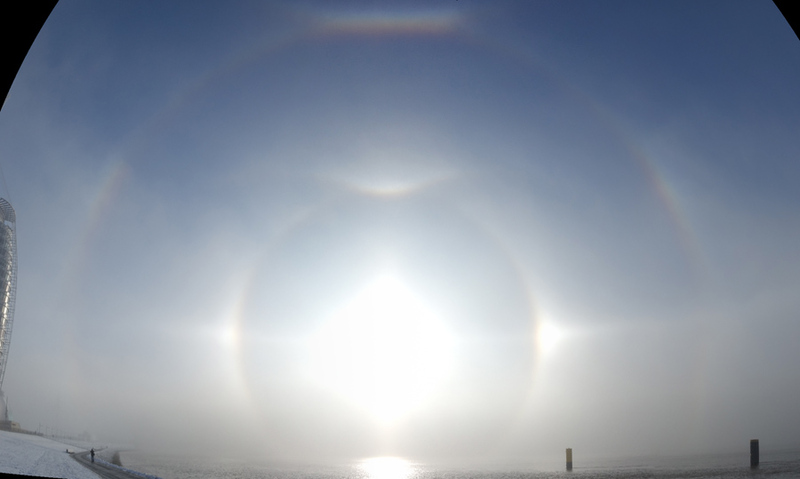 A halo phenomenon at the North Sea with its relatively mild temperatures certainly is an exceptionally rare sight. I was lucky to witness a similar display only last November at Boží Dar in the Ore Mountains which, however, was not as grand as the one in Bremerhaven – at least compared to what I saw due to my late arrival that day. 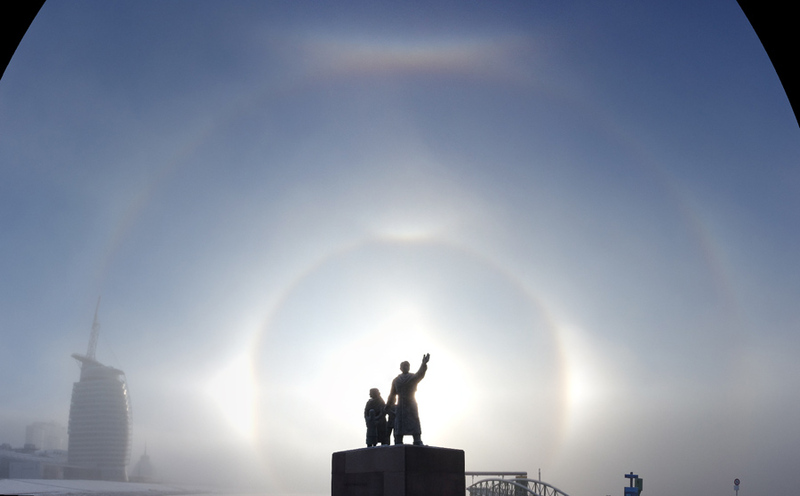 Many people saw the halos in Bremerhaven as they were just so apparent and bright. When I was outside at the bank of the river Weser, I saw people pointing at them and taking photos – wondering what it was what they saw there. 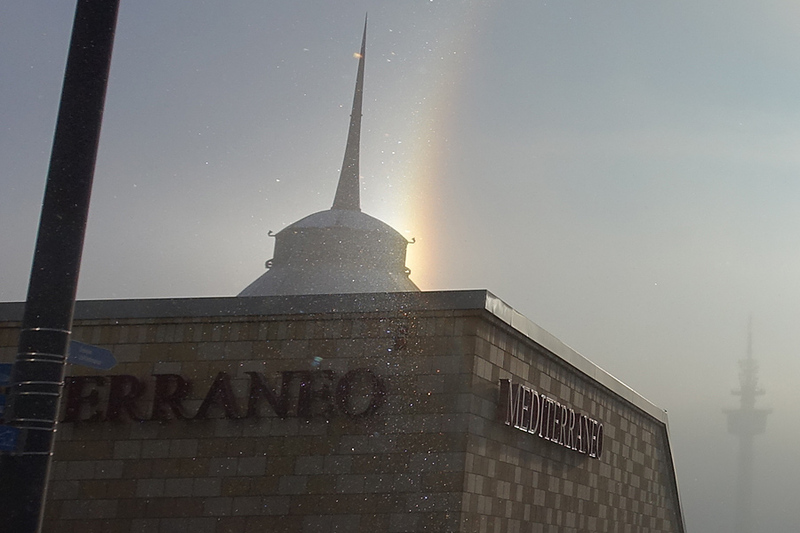 The halo phenomenon also made it to the local news and newspaper, showing images from around town. The “Nordseezeitung”, the regional newspaper, were happy to print a brief explanation that I had sent them as they had already received quite a number of “strange photos” showing multiple suns and rings around the sun. 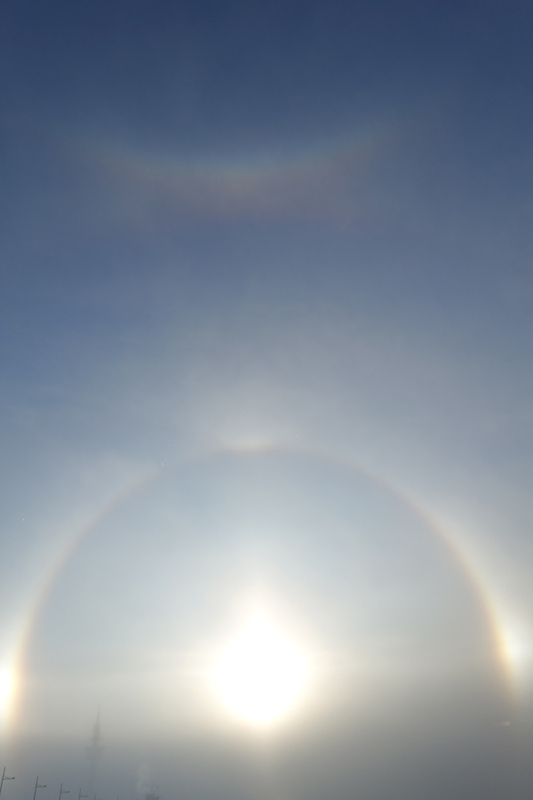 Personally, I have not seen a brighter halo phenomenon so far. 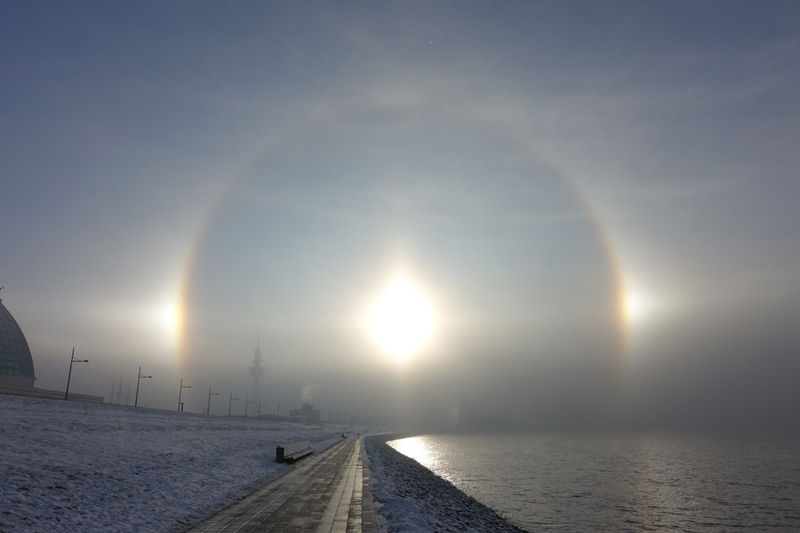 And I probably won’t see ice fog halos in Bremerhaven or elsewhere in the Northern German lowlands again for quite a while – if ever again. This entry was posted in diamond dust halos. Bookmark the permalink.